Tilden students learn appropriate use of technology in the service of learning. Handwriting is emphasized together with word-processing; manual and mental calculations are emphasized together with calculator and spreadsheet use; presentations using hand-made props are emphasized together with use of presentation software and screens. Technology learning is integral to classroom curriculum, introducing relevant tools as needed. 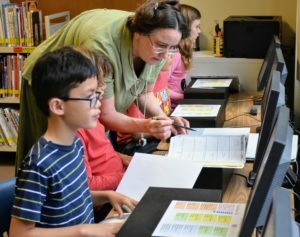 Third-graders begin with touch-typing, in support of the writing program, which emphasizes extensive revision, particularly in 4th and 5th grades. Having mastered this highest hurdle to effective word-processing, they go on to learn the basics of appropriate use of word-processing tools for student writing. Goals: Students should use the word-processor at least as comfortably as a pen or pencil for writing. Students should develop the habit of using software editing tools (spell and grammar check) cautiously. Intermediate- (fourth and fifth) grade students learn the basic parts of a computer hardware system, and how information is encoded and manipulated digitally. They learn some fundamental internet concepts, tools, and vocabulary. Using an elementary programming language, they explore some basic concepts of computer programming. 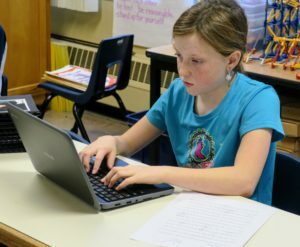 Intermediate grade students also learn to use online research tools, including Seattle Public Library online accounts and subscription databases and websites, searching strategies, copyright and fair use, and proper citation of online resources.